Ready to eat like a New Yorker without visiting the city of amazing food? The best part of this recipe is you probably already have the majority of the ingredients on hand! This recipe was inspired by my love of my city (NYC). 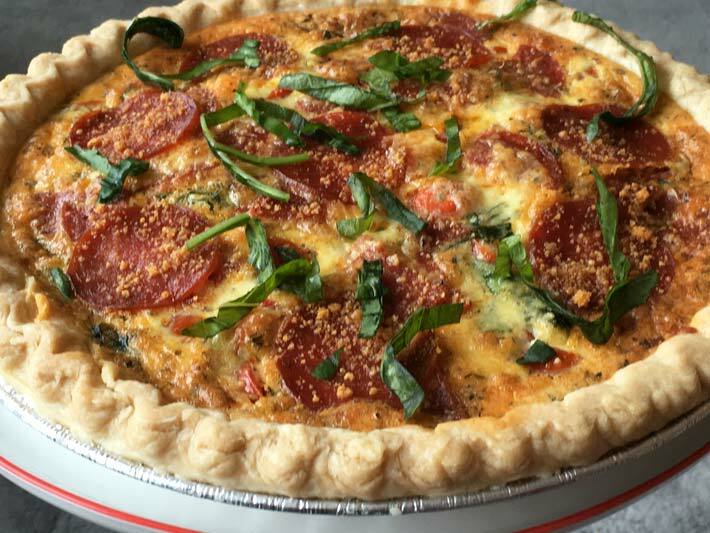 When I thought up this recipe I wanted you to be able to experience what it’s like not only to eat NYC like pizza in (quiche form), but feel like you are in the pizzeria. The herbs and seasonings are the same as the ones you find on the pizzeria wooden counter that you can choose to top your pizza. I hope you love this as much as me and Tom do. Everyone I make this for begs for more!!! I am so excited to get you a standing ovation in your own home! Prepare the custard and mix in the herbs first! Time to fill the shell! Evenly distribute the quartered pepperoni, 1/2 of the shredded basil and the sliced tomatoes. Honorable mention goes to East Village Pizza – they are also amazing)!